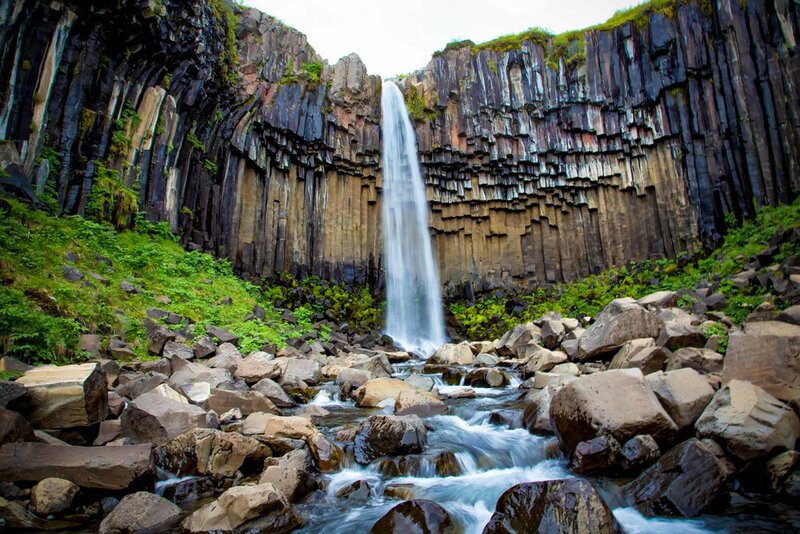 Iceland is probably best known as home to some of the most spectacular waterfalls on the planet, but the country does have much more to offer to tourists than just waterfalls. There are a multitude of other attractions and things to see and do when you’re in the country and if your trip doesn’t include a visit to one of the nations massive glaciers, you’ve really missed out on a golden opportunity. Given the fact that glaciers occupy at least 11% of the total land area of Iceland, glacial tourism has become a popular attraction in recent years. A simple Google search yields hundreds of results from the many tour operators who offer packages that include glacial hikes, ice climbing, snowmobile adventures, ice cave tours, etc. etc. etc. To be frank though, these tours tend to break the bank in how expensive they are. Likewise, if you haven’t planned your trip well in advance, its unlikely that you’ll be lucky enough to reserve a spot on one of the tours after you’ve already arrived in the country. That being said, even if you don’t join a tour, you can still see some of Iceland’s massive glaciers up close and personal during your travels. 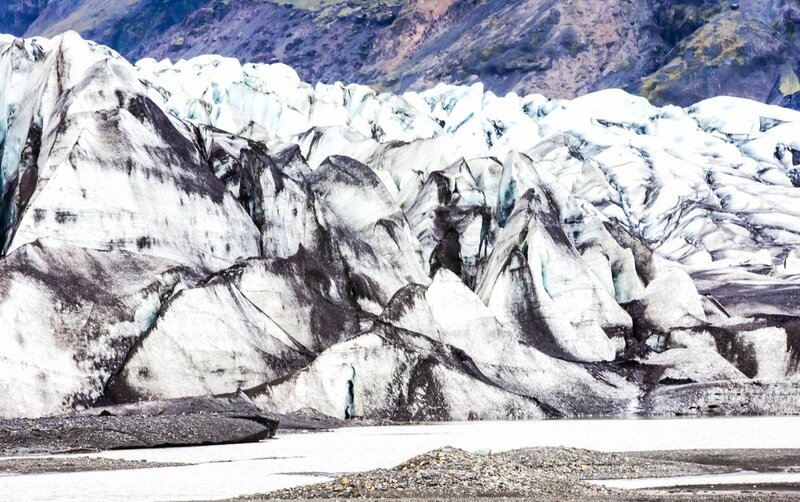 Iceland’s largest glacier, Vatnajökull is one of the most popular glaciers for tourists, especially with adventure tour groups but also offers quite a few attractions for individual tourists to enjoy. In this post, I’m going to focus on the glacier and the two beautiful waterfalls situated within Skafatafell National Park. Skaftafell, in Southern Iceland has been classified as a protected area since 1967 and is considered to have an environment resembling what you’d see in the ‘Swiss Alps’ with mountains, glaciers, rivers, a wealth of flora and fauna and a temperate climate that is somewhat uncommon for the area. The National Park was at that time Iceland’s largest environmental preservation area covering a massive 5000 square kilometres. In 2008 however it got even bigger when it was combined to form the “Vatnajökull National Park”, which is the second largest national park in Europe covering around 14,000 km2, or around 14% of Iceland’s total land area. Taking into consideration the sheer size of the newly formed National Park, it was decided that it would be divided into four geographic territories that would be locally operated and maintained to ensure that they could offer the best environmental protection and services to the public. The southern area, located in Skaftafell has a large visitor centre where guests can learn about the local environment and is also where most tour groups will start their tours of the area. The visitor centre also provides facilities for campers which includes a camp ground, toilets, washing machines, an on-site restaurant as well as free walking tours arranged by the park rangers. While you won’t find many roads through the park, there are several well-maintained hiking trails. Some of which will allow for great views of the Svinafellsjokull Glacier while others transport you up the mountain to check out the Hundafoss and Svartifoss waterfalls. The hiking trails in the park range in difficulty and length with the shortest being five kilometres while the others are much more time consuming and range between 16 - 20 kilometres each. Unfortunately it seems like a lot of people just pass through Skaftafell on their way to the Jokulsarlon Glacier Lagoon and completely miss out on the glacier and the waterfalls in the park. If you have the time, it is highly recommended to stop by the park for at least an afternoon and do the hike to the two waterfalls as well as the short walk to the glacier from the visitor centre. If you’re camping, you’ll definitely want to set up camp in the park for the night. I can’t imagine a better camp ground to spend the night. Svínafellsjökull is one of thirty outlet glaciers originating from Vatnajökull, the largest ice cap in Europe. Situated in the valley between two steep mountains, the glacier is about 10 kilometres in length and estimated to be about two kilometres at its thickest. As with most glacier tongues, a glacial lagoon has formed at the base of Svinafellsjokull thanks to the constant activity and melting of the glacier. The water in the lagoon appears to be dark brown in colour, but isn’t polluted - it is actually this colour because of the mixture of glacial water with black ash deposits which were collected over many thousands of years of volcanic eruptions. In the lake you’ll likely notice some beautiful icebergs floating by - while it is an exciting and unique experience to see something like this, it is also a bit sad when you realize that after thousands of years of being a part of the glacier, they are now floating to their death in the lagoon. Don’t let the little icebergs get you down though, the fact is that the glacier is in a constant state of motion and even though parts of it are floating away, it is constantly replenishing itself with fresh glacial ice. Part of the magic of visiting a glacial mouth like this is that you get to observe up close the activity taking place at the glacier - It may not seem that apparent when watching from a distance but you will most certainly be able to hear the constant cracks taking place. The glacier is a short walk from the Skaftafell Visitor Centre and should probably only take you about 10-20 minutes to arrive at the lagoon. Depending on the conditions at the lagoon (and the time of year that you visit) you may be able to get quite close to the glacier or not at all. In the past tours of Svínafellsjökull were offered with experienced guides - In recent years though, due to the instability of the mountains on either side of the glacier, the tours have mostly shifted to the nearby Falljökull glacier outlet instead. Still, the experience of visiting Svínafellsjökull is a highly recommended one - Especially if your trip to Iceland doesn’t include a group tour of a glacier. You’ll want to see one of these magnificent forces of nature up close while you have the chance! Once you’ve finished checking out the glacier, you’re probably going to want to set out on the short hike nearby to check out the national park’s waterfalls. Svartifoss is regarded as one of the most unique waterfalls in Iceland and for that reason it is a popular destination - So popular that people are actually willing to hike the five and a half kilometre route to see it. You might be thinking - Five and a half kilometres? That’s it? - And you’d be right to think so, but when you’re travelling in Iceland you’ll quickly learn that most of the destinations you’re going to visit are nothing but a short walk from a car park on the side of the road. The hike to the waterfalls starts out steep but rest assured it eventually flattens out and is actually more of a brisk walk than an actual hike. After about ten or twenty minutes you’ll start to hear the sound of rushing water - This will be your first indication that you’re getting close to the first waterfall, Hundafoss. Admittedly, for most people Hundafoss is just an extra treat on the trail to the more important destination - I’d argue though that if you don’t stop to enjoy this waterfall, you are really missing out. Visitors are able to enjoy views of the waterfall on either side of the gorge as well as being able to walk right up to the top of the falls and look over. Although when I did that it gave me a bit of vertigo when I looked straight down. Hundafoss is about 24 meters in height with a flow of water that varies between the summer and winter months. In the summer months you may find that foliage blocks a bit of your view, especially on the viewing platform constructed by the park authorities. In winter on the other hand the views of the waterfall are much more impressive, especially if the waterfall is frozen. Personally, I had no problem setting up my tripod to get photos of the waterfall on the platform provided. Once I crossed the river I also hiked down the trail for a few minutes to where there is a natural platform and a short trail that leads to the top of the falls. Once you’ve finished checking out Hundafoss, you’re about halfway to your final stop. After hiking for another ten or twenty minutes, Svartifoss will eventually start to come into your line of sight. Even though you can see the waterfall from quite a distance away you’ll still have to complete the hike and descend into the river valley. If there is snow on the ground you’re going to want to be careful walking on the trail in case you run into a patch of slippery ice. Once you’ve arrived at Svartifoss you’ll notice that there is a platform set up by the park authorities that allows visitors to get a pretty good view of the waterfall. The platform however is positioned a bit to the right of the falls and doesn’t allow for a front-on view. Even though there is a small gate with a warning sign not to pass by it seems like most people ignore it and hop over to get a bit closer to the waterfall to take their pretty photos. The gate is likely there primarily to protect the natural environment rather than tourists, so if you are hopping over, be sure to be careful but more importantly try not to destroy the place. What makes Svartifoss, or the “Black Falls” so unique is not the flow of water, but the beautiful wall of basalt rock columns that the waterfall is rushing over the 20 meter crescent-shaped drop. The columns of basalt rocks are something that you might have already seen when you visited the Reynisfjara “Black Beach.” Here though they are put on display as a naturally layered wall of columns that almost makes it hard to believe that it was formed naturally and not carved by hand. Some have compared the hexagonal columns on the rock wall to the pipes of a giant church organ, so it shouldn’t be surprising to know that the architects who designed Reykjavík’s most famous landmark, the Hallgrímskirkja church, looked to Svartifoss for inspiration! Hallgrímskirkja - Can you see the resemblance? Obviously it goes without saying that what you’re going to see at the waterfall will vary by season. During the summer months the area is known for its lush greenery with moss growing on the jagged rocks around the river. In winter on the other hand, the waterfall and the river tends to freeze and there is often snow on the ground. Even though I visited in summer, I would have really enjoyed the winter view a little more. The colours would have been much more contrasting with the black rock and the white snow. Maybe I’ll have to take another trip back to Iceland! Skaftafell National Park is located 327 km (203 miles) from the capital city of Reykjavik. If you are driving directly from the capital it should take you about four hours to arrive. Most people however will take several days to travel the Golden Circle and then make their way to the south of the country to visit the Black Beach, Skaftafell and Jokulsarlon. If you are driving, simply follow the ring road (Route #1) until you reach the park. When you are nearing the national park there will be lots of signage that will tell you when to make a turn. If you’ve decided that you’re not going to bother renting a car while visiting Iceland, you’ll have to rely on public transportation to get around. There are tours out of the capital offered by tour groups like Reykjavik Excursions which offer tourists access to several different stops. It is important to remember that if you want to book a tour that you should do so well in advance as the seats on the daily tours tend to fill up quickly. During winter your options for public transportation are limited, so you’ll want to reserve your seats early. Likewise, if you are booking a glacier tour from any of the tour operators, you’ll likely be able to find an option that includes round-trip transportation from Reykjavik. If you’re traveling through the south of Iceland, you’re definitely going to want to stop at the Skaftafell National Park for a few hours. If the glacier isn’t enough to attract your interest, there is also one of the most unique and beautiful waterfalls in the country. You’re sure to have a great time enjoying nature in this park and I’m sure that if you’re camping, a night spent in this park might be one of the best you’ll have in your travels! After the first few days of travelling in Iceland, I was starting to get a bit tired of waterfalls. It seemed like every stop along the road was a bigger more beautiful waterfall than the one that preceded it. Don’t get me wrong, I’m a big fan of waterfalls, but Iceland is certainly packed full of them. That was of course until we reached the Southern Coast and started to enjoy the spectacular views of the ocean on one side with and giant mountains and glaciers on the other. 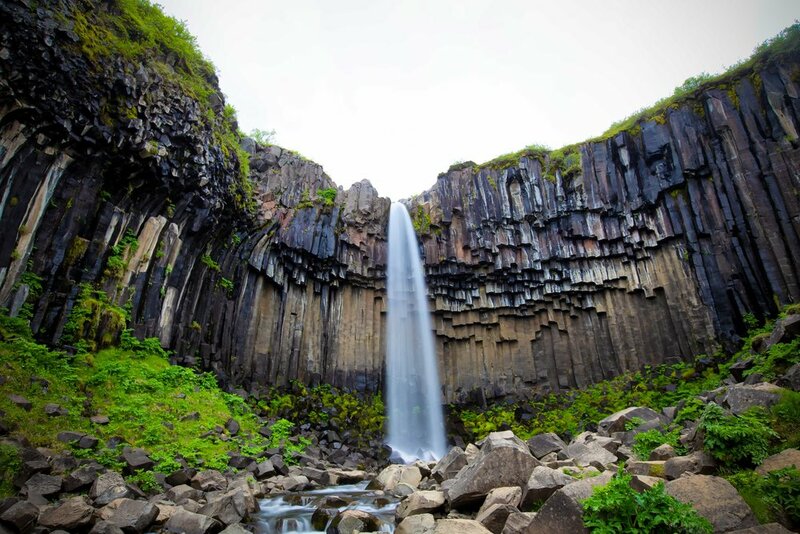 Even though a few of our stops along the Southern Coast of the country did include some waterfalls, the most memorable were the stops in places like the Dyrhólaey Lighthouse, Kirkjufjara Beach and the beautiful black sand Reynisfjara beach. While each stop was picturesque and enjoyable, I don’t think any of them could have compared to our stop at the breathtakingly beautiful Jökulsárlón Glacier Lagoon. I’m not exaggerating when I say that no amount of adjectives could really describe how we felt when we parked our car at a random parking lot along the highway, climbed up a small hill and discovered the prize hidden behind it. It was one of those moments in life where your heart skips a beat and you feel so happy to be alive. I was driving the car along the Southern Highway, it was late in the evening and we had just finished visiting Skaftafell National Park where we got up close to the Svínafellsjökull Glacier and then spent a few hours hiking to check out Hundafoss and Svartifoss. We were a bit tired and were in somewhat of a rush to get to our hotel when I pulled into one of the many makeshift parking lots next to the road. I figured we wouldn’t spend much time in this spot, so I grabbed my camera and left my camera bag full of lenses and my tripod in the car. We slowly climbed up the hill that acts as a barrier between the lagoon and the highway and once we got to the top our jaws dropped with the sheer beauty of what we saw. Then, with a much quicker pace we walked back down the hill to where we parked the car and grabbed all of our camera gear - This wasn’t going to be a place where we would just be spending a few minutes taking photos. A popular location for tourists, photographers, nature lovers and filmmakers, Iceland’s Jökulsárlón Glacier Lagoon is widely regarded as one of the country’s most stunningly beautiful locations and attracts thousands of visitors every year. The beauty of the lagoon is undeniable, but there is also a certain irony as its existence which should also serve as a reminder of the catastrophic effects of global warming and the damage we have done to our planet. The lagoon formed in the early 1900s when the Breiðamerkurjökull Glacier started to retreat - Since its formation almost a century ago, the the surface area of the lagoon has grown to almost four-times its original size with a currently size of 18 km². The Breiðamerkurjökull Glacier which provides the lagoon with its icebergs and most of its water is an outlet of the much larger Vatnajökull Glacier. Together the glaciers form the largest of its kind in Europe and covers almost ten percent of Iceland’s total land area (8,100 km²). Don’t let the size of the glacier fool you though, it is still retreating at an alarming rate with evidence that Breiðamerkurjökull alone has lost an estimated three square kilometres in land mass over the last century. 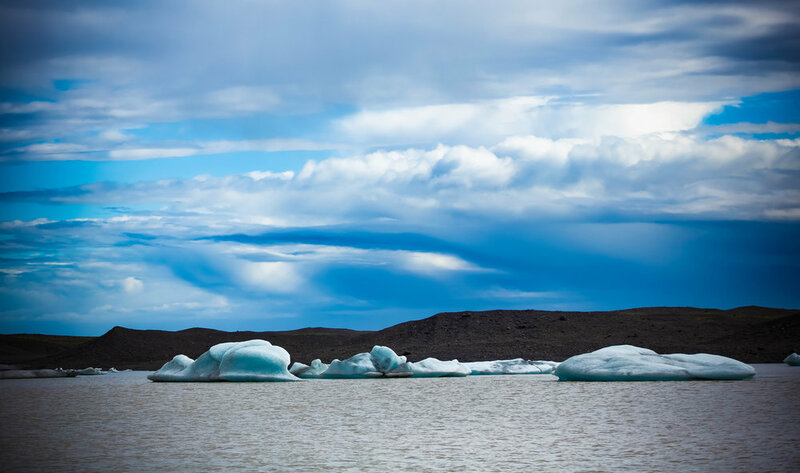 Most alarming is that the less than a century old glacial lagoon has become Iceland’s deepest lake with a current depth of around 248 meters - all of which used to be composed of ice. The icebergs that float around in the lagoon are chunks of the glacier that have broken off due to rising temperatures. Those huge chunks of ice that float around in the lagoon are often more than a thousand years old and once they’ve broken off from the iceberg more or less float around in the lagoon for around five years before they are eventually small enough to float out to sea. Even though most of the water in the lagoon comes from the melting of the glacial ice, salt water is also mixed in as the lagoon has a river mouth that meets up with the Atlantic Ocean. The mixture of fresh and salt water allows for a large variety of fish (salmon, herring, trout and krill among others) to swim upstream and settle in the area. The large supply of fish in turn makes the lagoon an ideal feeding ground for migratory sea birds and seals, both of which can be seen hunting for food. Another feature of the mixture of fresh and salt water is that it transforms the icebergs into either a milky shade of white or into a bright blue colour. The bright blue icebergs in particular which appear almost diamond-like become even more beautiful once the icebergs become small enough to float out to sea through the river mouth. Once they float out to sea they’re often pushed back into the shore which has created an additional attraction that has become known as the Diamond Beach. The first thing is that no matter what season, the water is extremely cold. If you climb down the hill to the shore, be very careful not to get too close to the water. Full body exposure to the water for less than a minute is enough to turn you into an iceberg. The second thing you’ll want to pay attention to is where the sea-birds are nesting. The birds tend to be very territorial and they are not afraid of humans. If you get too close, especially if they’re nesting you may get swarmed. You’ll also want to keep in mind that drone photography is strictly prohibited in the area. There are many places around Iceland where drones are banned but here at the lagoon it’s important to keep in mind that flying a drone is dangerous and will interrupt the nesting and feeding of the birds. As mentioned above, the birds are extremely territorial and are likely to attack, so if you care about your flying camera, you may want to leave it in its case while visiting. The Jökulsárlón Glacier Lagoon is around a 370km drive (around 4.5 hours) from the capital city of Reykjavik. Situated about halfway between the southern towns of Vik and Höfn, getting to the lagoon is quite simple as it is just a stop along the southern highway. It probably isn’t really a suitable destination for a day-trip out of the capital but if you are spending any time on your trip to Iceland in the southern portion of the country you should definitely make a stop. If you’ve decided that you’re not going to bother renting a car while visiting Iceland, you’re going to have to rely on public transportation to get to where you want to go. There are tours out of the capital offered by tour groups like Reykjavik Excursions which offer tourists access to several different destinations. It is important to remember that if you want to book a tour that you should do so well in advance as the seats on the daily tours tend to fill up quickly. Checking out the lagoon on your own is of course free of charge with free parking as well but you may also want to consider some of the boat tours of the lagoon offered by some of the various tour operators in the area. 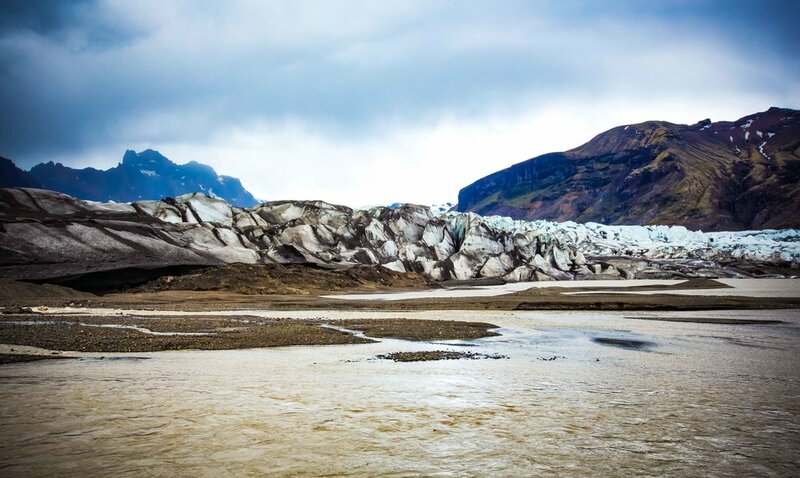 If your trip to Iceland doesn’t include the southern portion of the country, you’re really missing out - Some of the most breathtaking sights you’re going to see are located in the south and this glacier lagoon might just be the icing on the cake. I’m not sure that photos could really do this place the justice it deserves - You have to see it with your own eyes to truly appreciate how beautiful and peaceful this glacial lagoon is. Of all the destinations in Iceland, this one should be at the top of every travellers list.